Royal Bluematic is the lush little ganja bush that you really ought to be getting ready to grow. We breakdown the vital statistics for the sinsemilla that will reward your efforts with tasty blue buds in as little as 70 days. 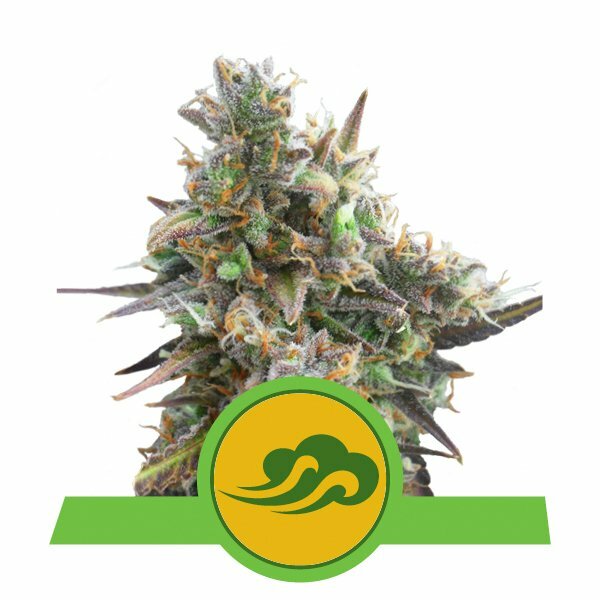 Royal Bluematic is an autoflowering cannabis strain almost 40 years in the making. Our bursting-with-flavour auto hybrid is a blend of Blueberry and ruderalis genetics, fine-tuned by the master breeders at Royal Queen Seeds. The original photoperiod-sensitive Blueberry strain is a combination of Thai and Afghan varieties that growers in the US first began crossing in the late-1970s. At the same time, a mysterious Russian subspecies of cannabis was being experimented with by a few cannabis mad scientists. Unlike photoperiod-sensitive strains, these ruderalis cultivars flowered naturally, regardless of the light-dark cycle. Blueberry would go on to start a dynasty of Blue strains that would become cannabis world stars. Unfortunately, ruderalis couldn’t replicate the same kind of success by itself. Well, at least not right away. By the mid-1980s, virtually all of the big name seedbanks in the game had either abandoned the pursuit of autoflowering cannabis hybrids or dismissed all ruderalis as ditch weed. Early attempts to cross sativa-dominant photoperiodic strains like Haze with various ruderalis specimens produced unstable offspring that were neither potent nor autoflowering. It’s important to remember that indoor cultivation was still something of a novelty until the early 1990s. Only Northern Lights and a few Skunk hybrids were viable options for growers using artificial lights. Dutch growers were certainly unlocking the potential of indica-sativa crosses and flowering times were indeed becoming shorter, but all high-quality weed was still photoperiod-sensitive. Lowryder and subsequent hybrids created during the early 2000s helped to reboot the ruderalis brand. However, low THC levels, leafy buds, and a harsh taste continued to put-off cannabis connoisseurs. Photoperiodic strains continued to dominate the market with a small niche for ruderalis amongst micro-growers emerging. It was only during the last decade that autoflowering cannabis finally reached a high enough standard to tempt the die-hard cultivators. RQS has been continuously re-engineering and expanding breeding projects to develop outstanding hybrids. Through rigorous selection processes and patient professional breeding practices, we have created an autoflowering hybrid that embodies the most desirable attributes of both parents. Royal Bluematic retains genuine Blueberry aromas and flavours, but now in a more compact, fully automatic package that still packs one hell of a punch. It’s all about the bud with Royal Bluematic. Plants will race into flowering only 3-4 weeks after they sprout. Indoors, maintaining an 18-6 light-dark schedule for the complete lifecycle is recommended. In contrast to the “stretch indica” habits of her photoperiodic parent, our girl grows vertically at a steady pace and peaks early. As the transition from vegetative growth into flowering is so swift, Royal Bluematic stays short. Energy is concentrated on developing a thick main cola and few bud-laden branches. 50-75cm is about the average height for mature plants, making Royal Bluematic ideally suited to micro-growers and SOG growers too. The Bloom cycle will be complete in 5-6 weeks from the onset of flowering. Towards the end, especially in cooler temperatures, it’s quite common for flowers to acquire a bluish hue. Tight buds with a nice frosting of resin and hints of blue/purple require minimal post-harvest manicuring. Scents of forest fruits will perfume the grow room. After 65-70 days, your Smurf-ish sinsemilla is finished. Feed light-medium doses of organic nutrients followed by a thorough flush for maximum flavour. Outdoor balcony growers will also find this strain to be of interest as she can really bush out anytime between spring-autumn. Royal Bluematic can produce as much as 120g/plant while staying less than 1m tall, even during a short summer growing season. A pleasant, relaxing high that is not too overwhelming or couch-locking makes for the perfect chillout smoke. Moreover, a sweet blueberry flavour with a touch of citrus goes down smooth, every single hit. However, too much chemical fertiliser will taint the taste. Make sure to flush before harvest if you are loading up on the nutes. Well-cured nugs of Royal Bluematic can become that rare stash that tastes as good as it looks. Fruity aromas and juicy flavours are not all she has to offer; tokers of all levels can respect Royal Bluematic’s 14% THC levels. A true blue auto bud. Due to its mostly Indica genetics, Royal Bluematic has a smooth, relaxing stoned effect. The flavour is much like our Blue Mystic, a sweet smell and blueberry-like taste.